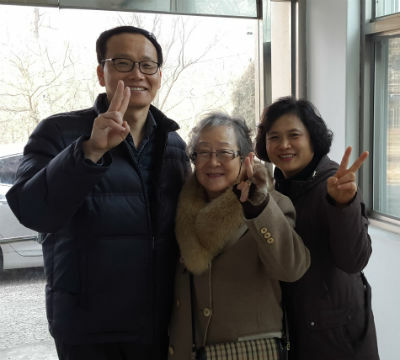 Photo: Pastor Moon and his wife with Bokja Lee (center). If you’ve ever stood in need of knee surgery, you know the kind of pain she was in. She’d saved approximately $17,000 (US) and used it all. Every last penny. Today she’s still in tremendous pain, but not because the surgery was unsuccessful or because she’s on a long road to recovery. She decided to forego the operation, but not because it was too risky or because she got cold feet. Instead of using the money for herself, she was impressed by the Spirit to give it all away. Bokja Lee chose to support a building project in the Philippines over paying for knee surgery, and she puts up with the constant reminder every day. This is the story of her radical generosity. In 2015, Pastor Moon of Mokopo Soonsung Church in South Korea traveled to the Philippines after asking Don and Caroline Armstrong, regional coordinators for Global Strategy to Asia and the Pacific, where a church needed to be built. Just outside Manila, the two discussed the great need for a church building to be constructed for Payatas Church of God. Pastor Moon, also the chairman of the Church of God in Korea, was so moved by the need that he brought it to the local church he serves. That’s when God began nudging Sister Lee to do something both selfless and sacrificial. Sister Lee uses a crutch today to get around until she can again save the money for surgery, but she couldn’t be more blessed. Her act of generosity has left a legacy of love that will translate to life change for untold numbers of souls. Such a model has proved successful not only in the Philippines, but also Tanzania, Bangladesh, and India. Now sights are set on implementing the strategy in the Church of God in Myanmar and Sri Lanka. The building in the Philippines is expected to be completed this August. YOU can be a part of what God is doing in the Asia-Pacific region of the world. Donate online under “Mission—Asia-Pacific” at http://chogglobal.org/giving-opportunities-asia-pacific/. Or, mail your donation to Church of God Ministries, PO Box 2420, Anderson, IN 46018. Be sure to write Project 42.30992 on the memo line. Learn more about Global Strategy at www.chogglobal.org. This entry was posted in All Church of God, Global Strategy and tagged Asia-Pacific, Bokja Lee, Caroline Armstrong, church building, construction, Don Armstrong, financial, generosity, Giving, Global Strategy, Missionaries, missions, Pastor Moon, Philippines, sacrifice, selfless, South Korea, stewardship, surgery. Bookmark the permalink.